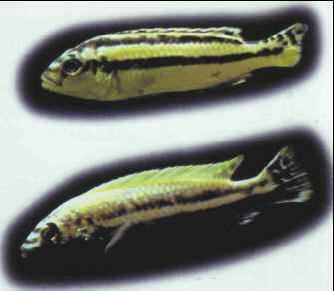 The Malawi golden cichlid is the most belligerent of all Mbuna species, especially in the case of the dominant male. The female deposits her eggs in an out-of-sight nest while the male keeps guard; he is recognizable by two dark horizontal stripes on a light background, a patterning reversed in the female. Size: 8 cm.